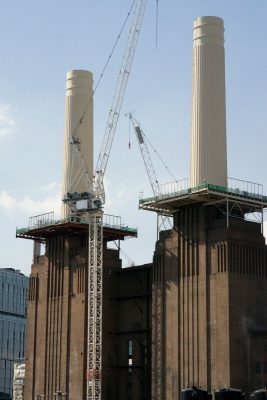 Battersea Power Station confirms that the painting of the four chimneys is now complete, earlier than expected. All four chimneys received a base coat and final coat of paint in the exact colour the originals were painted in to ensure they are visually identical. National Grid has now started to dismantle the disused gasholders next to Battersea Power Station to make way for new homes, shops and businesses. The site was decommissioned in 2012 and the demolition is expected to last until December next year. Improvements to the gas network and storage methods mean that the holders are no longer needed. 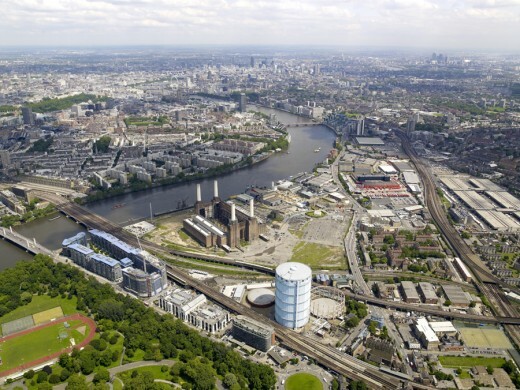 National Grid is currently in the process of selecting a development partner to help them realise their ambitions for the site which is located at the western end of the Nine Elms of the South Bank regeneration area. Several major development projects are already underway just a short distance from the gasholders including Riverlight, Embassy Gardens, Battersea Power Station and the new US Embassy. “For decades this facility was part of a vital gas network but the holders are no longer needed and the land can be released to meet the needs of today’s Londoners. “The site occupies a key location between established communities around Battersea Park and the new town centre taking shape within and around the power station. The land has clear potential to provide new homes and jobs as well as valuable new links to the new Nine Elms. Battersea Power Station became the most visited building to ever take part in Open House – attracting 40,000 visitors in just one weekend. Open House London was started in 1992 by Victoria Thornton and is an annual event held every September. This year there were more than 800 buildings, reports the BBC. In its first year just 20 buildings were open for visiting, including Finsbury Health Centre and Lloyds of London. Today the concept has “snowballed” to include 20 cities around the world. New York was the first city to replicate the event, in 2002. Detailed plans for the first phase of the Battersea Power Station redevelopment were approved last night (Dec 13) by Wandsworth Council’s planning applications committee. The ruling means that the site’s new owners can press ahead with the first part of an £8bn masterplan. Work is expected to start next year. Battersea Power Station is one of 27 major development sites located in Nine Elms on the South Bank – central London ‘s biggest regeneration area. During this first phase of work two new buildings will be constructed on vacant land to the west of the power station building. The new blocks will provide 800 homes, a hotel and space for cafes, restaurants, bars, a gym, pool, spa, theatre and office studios. The enormous development project in Nine Elms was granted ‘outline planning consent’ in 2011. The new application provides a detailed specification for the first stage of the development. “The new owners picked up the keys just two months ago so it’s very encouraging to see the project moving ahead so quickly. This site is vital to the regeneration of the wider Nine Elms on the South Bank area and in particular the Northern Line Extension. The application covers the details of the scale of the buildings and structures, the external appearance and the landscaping within Phase 1. A linked application has also been received covering the internal configuration of the residential units, parking and servicing, as well as sustainability, energy and waste strategies. Phase 1 consists of two buildings of varied heights between 8 and 18 storeys. They will be built to the west of the power station building on land which is currently vacant. It would provide 800 homes, a hotel and space for cafes, restaurants, bars, a gym, pool, spa, theatre and office studios. A new six-acre public park would form the setting for the new buildings. A Malaysian consortium of S P Setia, Sime Darby and the Employees Provident Fund (EPF), completed the purchase of the iconic site earlier this year. The new owners are implementing the approved masterplan for the 39-acre power station plot which includes the complete regeneration of the listed power station, the largest brick building in Europe and one of the most significant surviving examples of Art Deco architecture. The masterplan covers a full mixed-use redevelopment including new homes, offices, shops, restaurants and hotels as well as community, cultural and leisure facilities and have been agreed by English Heritage and Design Council CABE. For local people and visitors the development will mean better transport access and a wide range of shops and amenities including a health centre and riverside park. The consortium has also committed to supporting construction of the proposed extension to the Northern Line into the Nine Elms area. The new owners of Battersea Power Station have today (Wednesday) announced that they plan to start major redevelopment work in the second half of next year. A Malaysian consortium of S P Setia, Sime Darby and the Employees Provident Fund (EPF), has now completed the purchase of the iconic building in Nine Elms. Noticeable improvements to the derelict plot will be seen shortly with preparatory work scheduled to begin over the next few months. Phase One of the Battersea Power Station development would consist of residential buildings containing a total of 800 homes standing above a commercial podium which will include retail, restaurants, a gym, pool, spa, theatre and office studios. A new six-acre park, open to the public, adjacent to the river and directly linking to the 200 acre Battersea Park next-door, would form the setting for the new buildings. Outline planning consent for the power station scheme was granted by Wandsworth Council in 2011. A detailed application for the first phase of development is expected in October this year. Wandsworth Council leader Ravi Govindia said: “Today’s announcement is a significant step forward in the transformation of Nine Elms on the South Bank. The approved proposals to redevelop the 39-acre power station plot will include the completed regeneration of the Power Station, the largest brick building in Europe and one of the most significant surviving examples of Art Deco architecture. The plans cover a full mixed-use redevelopment of the 39 acre site; including new homes, offices, shops, restaurants and hotels as well as community, cultural and leisure facilities and have been agreed by English Heritage and Design Council CABE. For locals and visitors the development will mean better transport access and a wide range of shops and amenities including a health centre and riverside park. The consortium has also committed to supporting construction of the proposed extension to the Northern Line into the Nine Elms area. David Cameron announced on 26 Jul 2012 that the £8 billion project to transform Battersea Power Station into the hub of a new riverside development will begin in 2013. Architects for the Malaysian consortium remain unconfirmed. A consortium led by Malaysia’s SP Setia Bhd has bought London’s Battersea Power Station for £400 million ($623 million) and will redevelop the site into homes, offices and shops. The consortium, which also includes Sime Darby Bhd (palm oil plantation operators), had won an exclusivity agreement on the 15-hectare site last month and had been carrying out due diligence since then. The Malaysian consortium propose a mixed-use residential and commercial development in a 15-year project that will cost around £8bn. Reubens Brothers to invest £50m with Godfrey Bradman to buy site, report Property Week today. In February 2012 The Reuben brothers, who amassed a £6bn fortune through property and internet interests, bought Battersea heliport. David and Simon Reuben bought London’s only licensed commercial heliport for an estimated £25m from Andrew Davis, former chief executive of the Von Essen hotels group which has collapsed into administration. Boris Johnson’s re-election as London Mayor might scupper Chelsea FC’s hopes of transforming Battersea Power Station into their new home. Chelsea FC confirmed they had submitted a bid to build a 60,000-seater stadium on the 39-acre site in Wandsworth, hours before Johnson was declared the winner in the battle to run the capital for the next four years. The London Mayor’s chief of staff and Deputy Mayor for planning, Sir Edward Lister, has said he doesn’t think the site is suitable for Chelsea. Initial designs for the Battersea Power Station Stadium have been made by KPF Architects. A conference took place on 20 Apr 2012 organized by the Twentieth Century Society at the Building Centre, 26 Store Street, London WC1E 7BT. With support from the Building Centre Trust. The aim of the conference was to assist the public and media by presenting well-informed opinion about the development site in the light of new opportunities, with a focus on the retention of the Grade II* listed building. The Guardian report that this major London building, unused since 1983, is to be sold. Stephan Mile-Brown, the head of residential development at the estate agent Knight Frank, which is handling the sale, said: “This is the first time Battersea power station has ever been offered for sale on the open market. Knight Frank expects to receive final bids in autumn 2012. The Guardian report Battersea Power Station pushes another developer into administration. The Irish property firm failed to repay debts of £340m. The 40-acre site in south west London is valued at £500m. The 40-acre site in south west London, valued at £500m in October, will be put up for sale after a high court judge placed four subsidiaries of Battersea’s holding company into administration on Monday. They failed to repay £324m of debt owed to Lloyds Banking Group and Ireland’s National Management Asset Agency. The lenders lost patience with the holding company’s owner, the loss-making Irish property firm Real Estate Opportunities. Moreover, Hong Kong developer Victor Hwang, who sold the power station to REO for £400m five years ago, has called in a £178m vendor loan. Chancellor George Osborne and London Mayor Boris Johnson were in Battersea on Monday, promising redevelopment and an extension to the Northern Line, largely funded by developers, report the BBC. But three days on and it looks as if the developers are heading for administration while Labour’s mayoral candidate Ken Livingstone has called it an embarrassing blow. So, what now for this grand plan for London? Administrators are lined up to take control of Battersea Power Station. Lloyds and Ireland’s National Asset Management Agency have demanded the repayment of £324m of debt from Irish developer Real Estate Opportunities, the majority owner of the site. They have secured a High Court hearing for 12 Dec to consider the appointment of Ernst & Young as administrators for the Battersea Power Station development. The banks are to explore proposals from Roman Abramovich and Chelsea FC, who have expressed an interest in the site for a new stadium for the football club. Following the announcement, BPSCG member called for Battersea Power Station to be returned to the public sector, with repairs to be funded by the Heritage Lottery Fund. Five years to the day after it was announced that Treasury Holdings was taking over at Battersea Power Station, and after months of speculation, it has been announced that NAMA and Lloyds Bank are calling in the administrators. The announcement comes two days after George Osborne and Boris Johnson visited the Battersea Power Station site. The £5.5bn redevelopment of Battersea Power Station has cleared the final regulatory hurdle after Eric Pickles, the Communities Secretary, gave the scheme the green light. The decision means Treasury Holdings, the developer, could start construction in 2012. However, Treasury first needs to secure a capital injection to finance the project. Rob Tincknell, managing director of Treasury, said talks with potential joint venture partners were “productive”. The power station is one of London’s most recognisable landmarks but has lain dormant since 1983 despite attempts by a collection of owners to develop it. Treasury’s proposals comprise 10m sqft of offices, shops and 3,400 homes. However, the Irish-backed developer must also agree financing terms on a £600m extension to the London Underground. First phase architects were named as Ian Simpson Architects and dRMM. Wandsworth Council issue planning approval for the redesigned Battersea Power Station development. More information online soon. Tower abandoned after opposition from major politicians such as the London Mayor. Chimney reduced to 250m high from 300m. Facing opposition from major politicians such as the London Mayor. The developer has warned that refusing the revised tower may jeopardise the Nine Elms area regeneration. Rafael Viñoly Architects PC and Real Estate Opportunities Limited (REO) have revealed the master plan design for the redevelopment of the historic Battersea Power Station site along the River Thames. 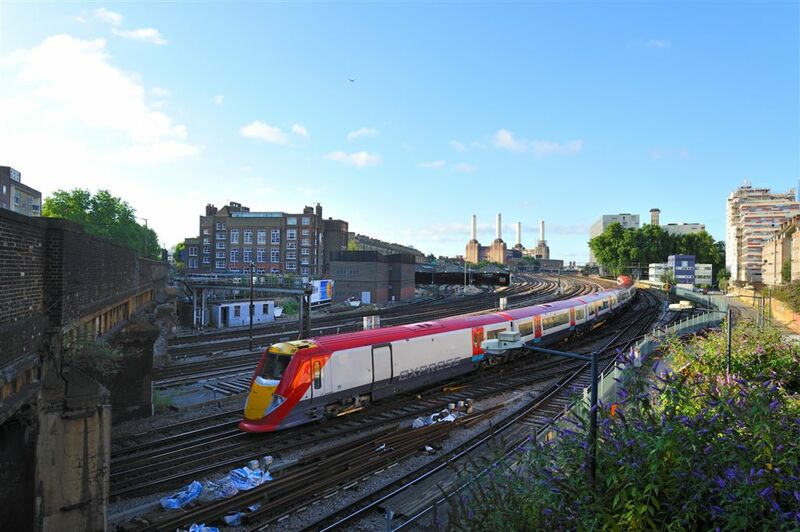 Designed and constructed in the 1930s by Sir Giles Gilbert Scott, the station, which was in operation until 1983, will now be revived as a vital element of the most advanced sustainable development ever built in the United Kingdom. The 8 million-square-foot master plan will provide residential, retail, hotel, and office space, as well as leisure, cultural, and community accommodations on the largest development site in central London. The Battersea Power Station initiative will act as a catalyst for the regeneration of the wider Nine Elms Corridor. The power station will once again be used to produce electricity with a new combined cooling, heat and power plant, but it will employ renewable resources to do so. Surrounded by public parks and plazas, the key historic spaces of the station will be preserved, with key elements redeveloped as a commercial complex including a museum and open-air park. 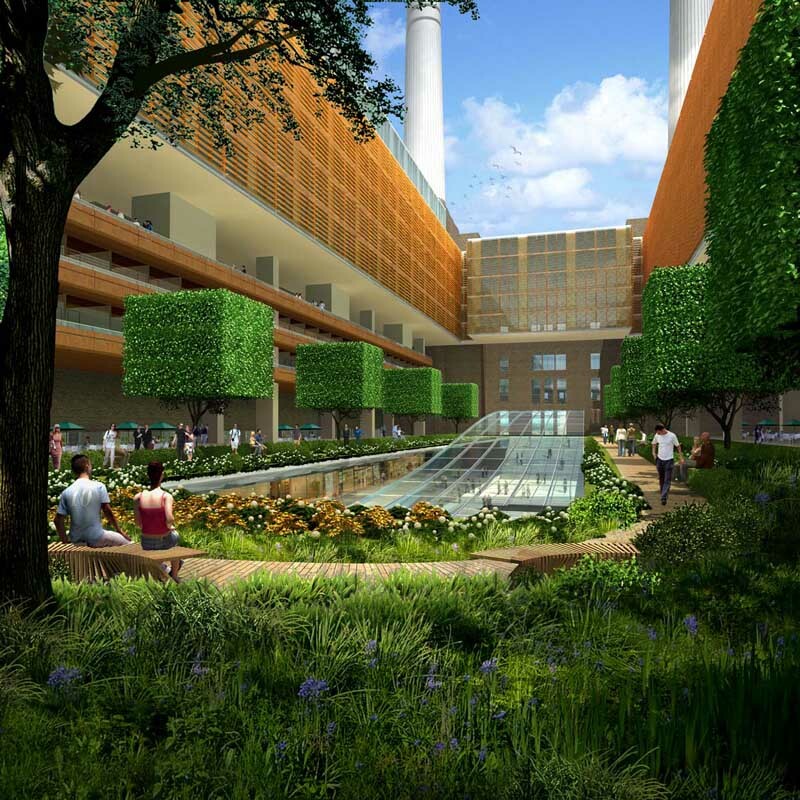 Alongside the power station, a landmark “Eco-Dome” and “Chimney” will incorporate the largest solar-driven ventilation system ever conceived, funneling hot air through the central shaft of the tower and drawing in cool air at ground level. 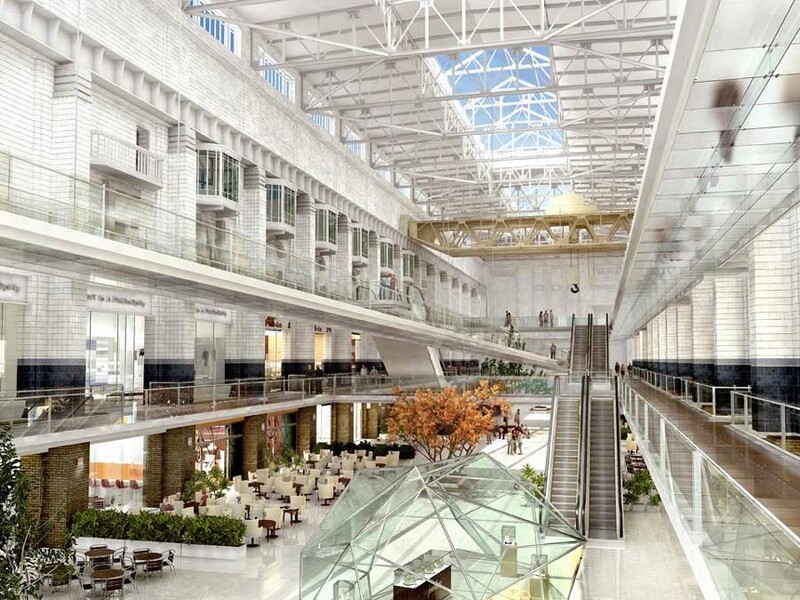 This will eliminate the need for air conditioning in the commercial and ground floor retail spaces housed beneath the Eco-Dome, decreasing energy demand in the buildings by as much as 67 percent and dramatically reducing carbon emissions. The Eco-Dome will incorporate a new underground station, providing enhanced public transportation access to the site. Rafael Viñoly Architects’ project director for the complex is John Drew. Headquartered in the firm’s London office, he is also leading its high-profile Curve theatre project for Leicester, England, among others.